Here I sit wondering if you've dropped in yet to check out the 1st Annual International Astrology Day Blogathon March 19 - 21, 2010. 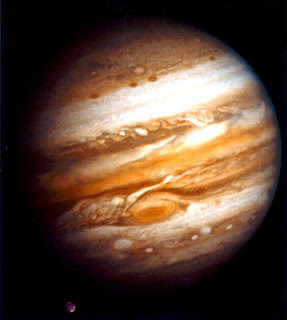 The Blogathon's Schedule of Articles leads with strong-arm Pluto taking over Friday March 19, Saturn managing his namesake day Saturday ( March 20) perfectly well and efficiently, and Uranus erking jerkily up to meet the Aries Point of Prominence, a World Point of Manifestation which can be a breakthrough position indicating most often a 'scientific breakthrough' of some kind which benefits or hinders large numbers of people, and now appearing just in time to light up Spring Equinox 2010. 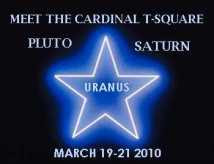 Why, it's been about 84 years since revolutionary rebel Uranus, The Awakener and The Witness, streaked through this Mars-ruled area of the zodiac! The quirky, erratic Sky God of the planets can be associated with natural disasters, it must be added. And after all, 2010 is a year of a Great Conjunction of Jupiter and Uranus thus generously expanding the principles involved in the picture: transit Uranus = AP = scientific breakthrough/s of merit and/or significance. Jupiter/Uranus has a definite light-bulb-over-head vibe for brilliant insights to suddenly stun us with their ingeniousness. Air or space travel innovations may be on the menu and scientists' work on energy sources may be on the verge of a big publicity splash. 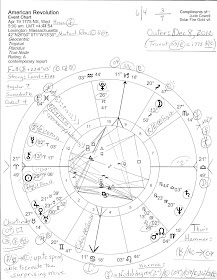 Now I know you'll keep in mind that July 11, 2010 brings along a Solar Eclipse conjunct a difficult degree in the zodiac (Tropical) @ 19 - 20 Cancer, a critical range traditionally; plus, Castor's reputation as a troublemaker precedes him. Here's what Anthony Louis gives for Castor in his Horary Astrology Plain and Simple: 'sudden fame or loss; murder; mental illness; crippling of limbs'. Brady adds 'an intellectual writer' and both stars of The Twins can be inspirational muses for writers and other artistic, creative enterprises. Pluto's degree of Discovery is around 19 - 20 Cancer as well and you know what the atomic Mr. Underworld signifies - obsessive control of all factors and schedules involved with his endeavors. Pluto keeps himself aloof and is quite neurotically anti-societal, you know, if not a gangster. Well, generally I'd say our globe is in line for a unifying event of some kind; plus, it feels to me as if there may be multiple events of note during 2010 into 2011. These are the reasons I want you to have the Astrology Day Blogathon 2010's link for How-To-Deal articles and insights to encourage you to pause and think a while along new tracks while appreciating for a moment another person's perspective. For as the Tarot says, if you're fortunate enough to be able to pause and consider your options, do so. Plus, eclipses in Cancer spotlight domestic issues such as land, real estate, homes, homeland, questions of and need for security, grains/other food crops, food supply and its transport concerns, food additives, food and poultry inspection, and nurturing sources including food banks and other charities. Cancer has its primordial links with oceans, crustaceans, and with shrewd business practices and creative talents, too. Unfortunately, Fixed Star Castor is usually a problem when and wherever it is activated or contacted. From our earthly vantage point upon our little blue sphere a contact with Castor seems to ramp up its expression on an archetypal level. It's a bit like in the film The Mummy - an ancient archetype comes to 'life' either within one's psyche, in muliple psyches, and perhaps upon the physical plane if all factors coincide and the will is there. In mythology, Castor is brother to Pollux, of course, the dark-light Twin Stars of Gemini, and you can toss your mouse about 3 inches and find web-based info on them all over the interweb. Then why not sashay yourself over to an original researcher on the subject of Fixed Stars and parans, Australian astrologer Bernadette Brady? You can hardly do better! Especially if Fixed Stars warm the very cockles of your astrologer's heart. So, Brady's Predictive Astrology gives the July 11, 2010 Solar Eclipse as being in the 12 South Series and I shall remind you that 12S is the Pre-Natal Eclipse Series during which America was founded, occurring prior to July 4, 1776. Don't you find it a helpful trait when using eclipses in your charts that a precise birth time isn't necessary with Fixed Star and paran work (such as that of Bernadette Brady) for one looks at the entire 24 hours of the day - your day, the day or night of your birth, you cute little dickens, you. With star parans, a horoscope is divided into quarters so that a lifetime is described by quarterly markers for life's chronological phases, and the Fixed Star/s during our day of birth, if any, are linked to a particular planet (or planets) as they arose, culminated, set, and crossed the midnight point at the Base or Foundation Point of the chart, aka The Drain. Thereby we are informed of the time period of our lives in which certain archetypes and myths (some of them inherited family myths) 'play out' and flavor our motivations and actions (either consciously or most often, unconsciously) and spark (Uranus!) and inform us so we may express their starry mythological energies (stories) in more positive ways than was done heretofore by our ancestors. 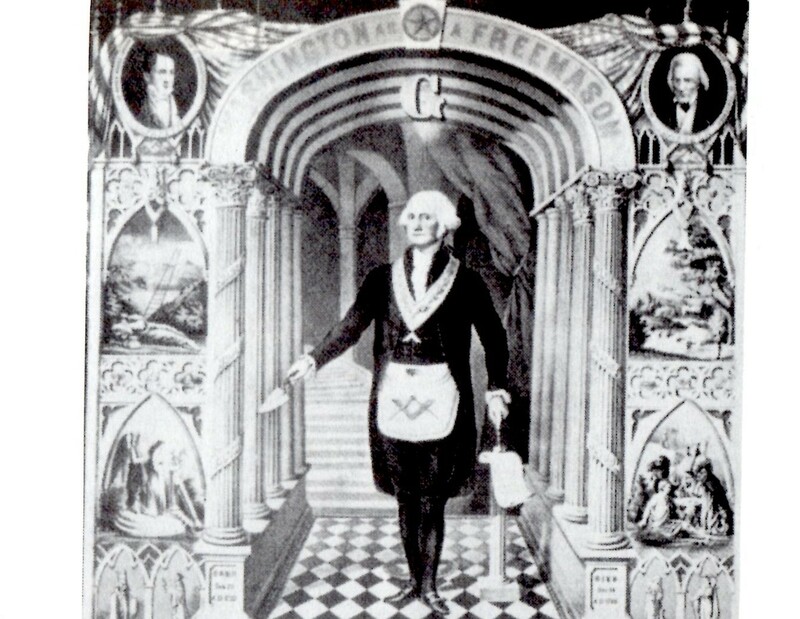 1902, 1919, 1938, 1956, 1974, 1992, and July 11, 2010; the next manifestation will be in 2028.